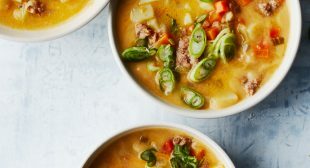 This Cheeseburger Soup recipe is a rich and cheesy bowl of comfort food made on the lighter side. It’s quick and easy, loaded with turkey and potatoes in every bite! 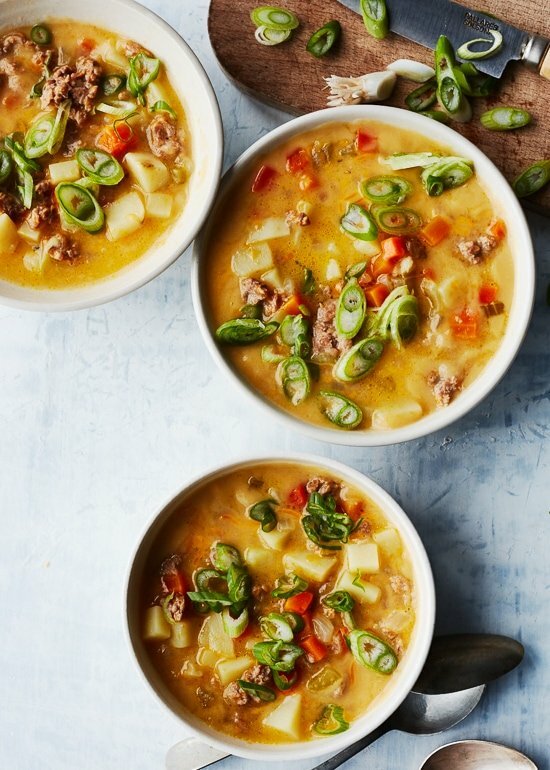 Cheeseburger soup is always a hit with my family! It’s the kind of soup you crave on a cold night. This recipe, from my newest cookbook Skinnytaste One and Done is made all in one pot with directions for the Instant Pot or stove! I’ve partnered with ALDI to give you a sneak peak into the book and share this recipe with you all! It’s thick and cheesy with chunks of potatoes and turkey. To get it creamy without adding any cream, I add a large piece of cauliflower to the pot and leave it whole, then puree it in the blender with some of the broth. The results are rich and velvety, and so, so good and a great way to sneak cauliflower into your kids dinner!